As we approach the Christmas holiday period, I thought I’d share a cautionary tale on setting up your Out-of-Office auto-response. For quite a while now I have been building a relationship with a prospective customer. While I have had discussions with a person there – let’s call him Bob – Bob has worked hard to keep his privacy. I have an email address I can use to contact Bob, but that is all. When we’ve had a phone conversation Bob has always called me with “number withheld”, and has declined to provide me with a phone number so I can call back, instead inviting an email reply. This is frustrating, but Bob is the (prospective) customer so I perfectly respect this. I certainly would not indulge in open source intelligence, or social engineering approaches to obtain these details. On my most recent email to Bob, I got an automated Out-of-Office message, saying he was away from the office for a week. Bingo! The footer of the message contained full contact details, including Bob’s mobile number. The dilemma: Do I call Bob on this number to progress the opportunity? At the very least I’ll drop them an email to alert them to the privacy violation. 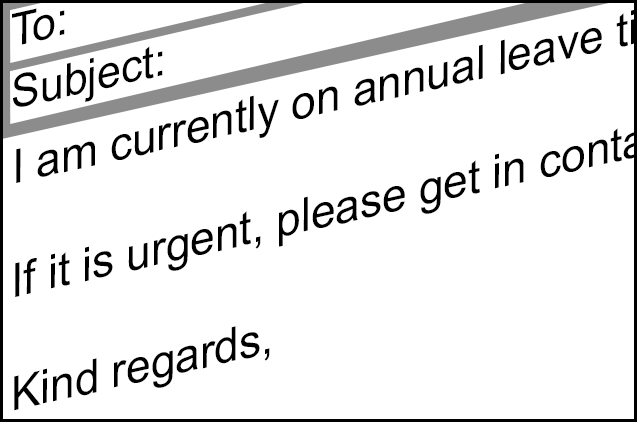 The moral is check your automated out-of-office messages – do you really want to reveal full contact details to any spammer that sends you an email while you are out of the office?